Middlesex Division 1, Col. D. B. Kelly Division of the Ancient Order Of Hibernian’s. Recently honored members at their 15th Annual Awards Dinner. Awards were given to Hibernian of the Year – Mons.John Gordon Division Chaplin, Irishwoman of The Year – Anna Mae O’Connor, Irish Flag Raiser of The Year – Ricky McMann and Irishman of The Year – James “Butch” Williams. 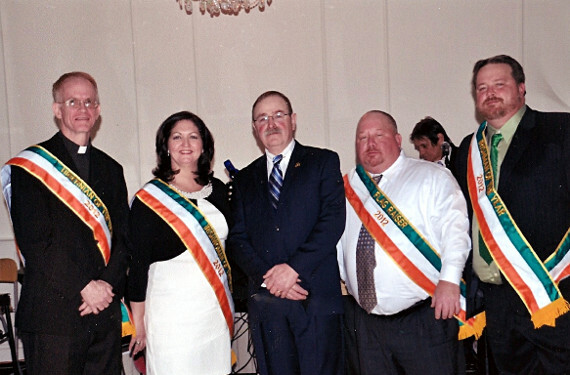 Pictured from left to right, Hibernian of the Year, Mons.John Gordon Division Chaplin, Irishwoman of The Year Anna Mae O'Connor, Division President James Riehl, Irish Flag Raiser of The Year Ricky McMann and Irishman of The Year James "Butch" Williams.